With a partial government shutdown on the horizon, President Trump and Democratic leaders had a heated exchange over border security and wall funding in front of reporters. 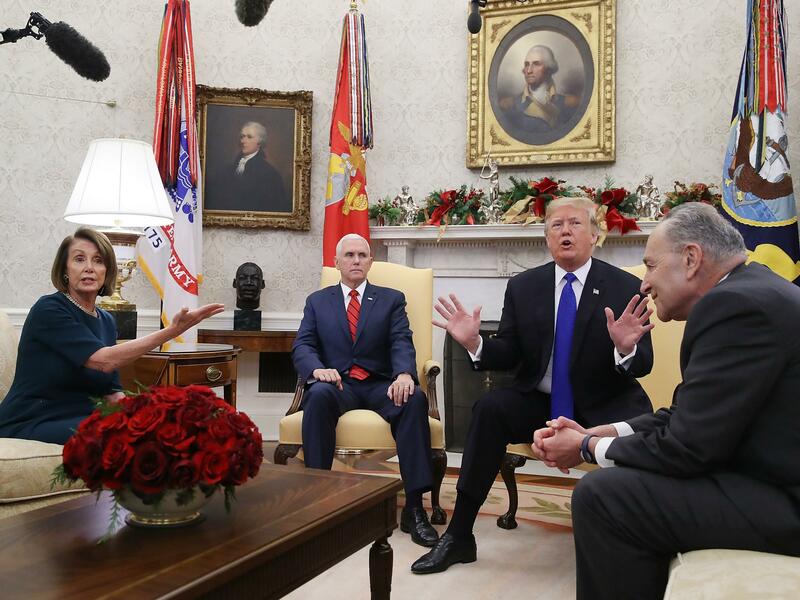 In a testy Oval Office exchange with the two top congressional Democrats, Rep. Nancy Pelosi and Sen. Chuck Schumer, President Trump made clear he would be "proud" to shut down the government in less than two weeks if he doesn't get funding for his border wall. "I'll be the one to shut it down. I will take the mantle. 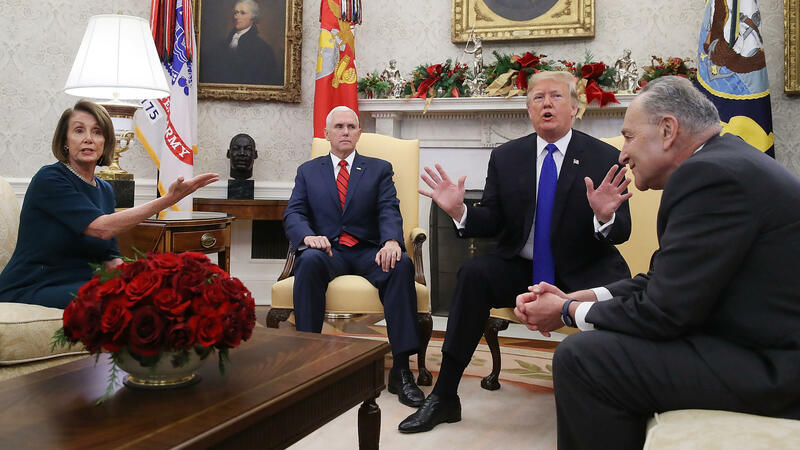 And I will shut it down for border security," Trump told House and Senate Democratic leaders as Vice President Pence sat by stoically. The statement from Trump came in an extraordinary show before the cameras and the press, with minutes of tense back-and-forth with both Pelosi, the likely incoming House speaker, and Schumer, the Senate minority leader. Democratic leaders have made it clear they don't intend to give the president a victory on funding for his signature border wall, and afterward they released a statement reiterating that "We gave the president two options that would keep the government open. It's his choice to accept one of those options or shut the government down." Pelosi told reporters on Capitol Hill at a holiday reception later Tuesday she and Trump had spoken on the phone but there was no response to the earlier offer from her and Schumer. According to an aide, the call was around 4 p.m. and lasted about a minute. Speaking immediately after the meeting, both Schumer and Pelosi thought they had emerged with the upper hand after seemingly baiting Trump into taking the blame if there's a partial shutdown just days before Christmas. "This Trump shutdown, this temper tantrum he seems to want to throw, will not get him his wall," the Senate minority leader told reporters outside the White House. Throughout the meeting, Trump kept insisting that much of the wall has already been built (numerous fact-checkers earlier this year determined it hasn't, which Schumer pointed out) and he has also said that the military can build the rest. In a statement provided to NPR Tuesday evening, a spokesperson for the Department of Defense said "to date, there is no plan to build sections of the wall." But "Congress has provided options under [existing law] that could permit the Department of Defense to fund border barrier projects, such as in support of counter drug operations or national emergencies." During the 2016 campaign, Trump also kept claiming that Mexico would pay to build the wall, but he has since dropped that talking point. Pelosi insisted during the meeting that the cameras should leave, saying afterward she made such a request because "we didn't want to contradict the president when he was putting forth figures that have no basis in fact. ... I didn't want to say in front of those people, 'You have no idea what you're talking about.' "
Except by making that comment just after leaving the Oval Office, Pelosi was saying just that. She also kept trying to explain to Trump that there wasn't enough support even in the GOP-controlled House for his border wall, urging him to accept a continuous funding resolution at the current spending levels, or $1.3 billion for a year. But Trump kept interjecting to shift blame, saying a House vote wouldn't matter since he needs to get to 60 votes in the Senate anyway and that would require help from Democrats — a frequent complaint of his. Back on Capitol Hill, Pelosi told fellow Democratic lawmakers in private that she was "trying to be the mom" in the room. "I can't explain it to you. It was so wild. It goes to show you: You get into a tinkle contest with a skunk, you get tinkle all over you," Pelosi said, according to an aide in the room. "You can't let him take you down that path. But the fact is we did get him to say, to fully own that the shutdown was his. That was an accomplishment." In another comment sure to irk the president, Pelosi went even further, saying that Trump's obsession with the border wall is "like a manhood thing for him. As if manhood could ever be associated with him." The tense exchanges underscored the challenges in the coming two years of divided government. Trump diverted from discussing Democrats' takeover of the House, choosing to focus on GOP gains in the Senate — thanks, in large part, to a very Republican-friendly map in the 2018 midterms. "When the president brags that he won North Dakota and Indiana, he's in real trouble," Schumer jabbed. "Well, I did," Trump retorted. The White House tried to paint a very different picture of the meeting after the fact, with press secretary Sarah Sanders saying in a statement, "President Trump had a constructive dialogue with Democrat Leaders Chuck Schumer and Nancy Pelosi," although "Major disagreement remains on the issue of border security and transparency." Trump himself told reporters later on Tuesday that "believe it or not, I think it was a very friendly meeting. ... I've actually liked [Schumer and Pelosi] for a long period of time, and I respect them both" and that "when the press left, we had a fairly long meeting and we really discussed a lot of great subjects." And the president showed no regrets for having said he would own a shutdown if it comes to that. "If we close down the country I will take it, because we're closing it down for border security, and I think I win that every single time," Trump said. Speaking on Capitol Hill, Senate Majority Leader Mitch McConnell, R-Ky., acknowledged it had been a "spirited meeting" at the White House, but that "I'd still like to have a smooth ending here" and avoid a government shutdown. "I'm sort of hoping for a Christmas miracle here that we'll have a level of cooperation that we don't normally have in getting bills across the Senate floor," McConnell said, pointing to not just the government funding bill but the farm bill and a criminal justice overhaul. Democratic resistance to funding the wall may have prompted Trump's pre-meeting tweetstorm, which over a series of five long tweets seemed to simultaneously concede defeat and declare victory on wall funding. Troops have been stationed along the Southern border with Mexico since just before the midterm elections, and while some are being extended through the end of January, other units have been sent home. "He's talking about reprogramming/transferring funds from other [Department of Defense] programs," said Stan Collender, a federal budget expert, when asked if he could explain the Trump tweets. "That would indeed take away resources from other activities." Collender said he wasn't sure how much discretion Trump would actually have to do this and said it will "get the new Democratic House very angry." Even before the Tuesday morning tweetstorm, in recent days Trump had been far less specific about his demands for border wall funding than he has been in past rounds of budget talks. Sometimes he leaves out specific dollar amounts (though the standing request is $5 billion). And his use of the phrase "border security" indicates more than just funding to build the wall. "Congress must fully fund border security in the year-ending funding bill," Trump said Friday in a speech at a law enforcement conference. "We have to — we have to get this done. They're playing games. They're playing political games. I actually think the politics of what they're doing is very bad for them, but we're going to very soon find out. Maybe I'm not right, but usually I'm right." Democrats, looking at public opinion, may feel they have some leverage in the talks. A new NPR/PBS NewsHour/Marist Poll out Tuesday shows that 57 percent of Americans, including 63 percent of independents, want the president to compromise on the border wall to prevent gridlock and not risk a government shutdown. Two-thirds of Republicans, however, want the president to stand his ground. And Trump is often laser-focused on his base. A history of failed meetings with "Chuck and Nancy"
The days of high expectations for White House summits leading to bipartisan breakthroughs were well in the past even before Tuesday's Oval Office throw down. A little more than a year ago, Trump had a couple of meetings with Schumer and Pelosi. He said he had worked out a deal on immigration with "Chuck and Nancy," as he called them. "I think something can happen," Trump told reporters. "We'll see what happens. But something will happen." Nothing happened. The deal blew up without even an agreement on what the deal was. Can Trump work with a Democratic House next year? The sparring between Trump, Pelosi and Schumer may well be a preview of the next two years of divided government. Both Trump and Pelosi, who is expected to once again become speaker when Democrats take control of the House, have talked about the potential for bipartisan compromise on things like infrastructure and prescription drug prices. But they've also both foreshadowed conflict. Pelosi and Democrats are promising robust investigations of Trump and his administration, and Trump has said that would lead to a "warlike posture." "Then at the end of two years, nothing is done," Trump predicted. "Now what's bad for them is being in the majority; I'm just going to blame them." This leaves many questions: Are Democrats willing or able to compromise with Trump? Is Trump willing to deal? If he is, will congressional Republicans go along? And given the way Trump has changed his mind in the midst of past negotiations, will anyone trust him? Still, allies of the president and Pelosi interviewed for this story say some limited compromise is possible. "I think there's several positions the president has that frankly line up more traditionally with Democrats," said Marc Short, former director of legislative affairs for the Trump administration. "The question I think that is yet to be determined is whether or not Democrats will give their leadership the flexibility to negotiate with the president." That's one way of pinning blame back on the other party when big things fail to get done. Short also questioned whether Democrats would be willing to give Trump a win as he begins his re-election campaign in earnest. John Lawrence, a former chief of staff to Pelosi, countered that Democrats are likely open and looking to cut some deals. "[Pelosi] is going to be, and I think Democrats in the House are going to be, concerned with proving that they can be trusted that they can govern," Lawrence said. Short and Lawrence both see incentives for their respective parties to get something done, while questioning whether those incentives exist for the other side. But first they have to make it to next year. And the budget fight brewing as 2018 closes out could well affect the relationship going forward. 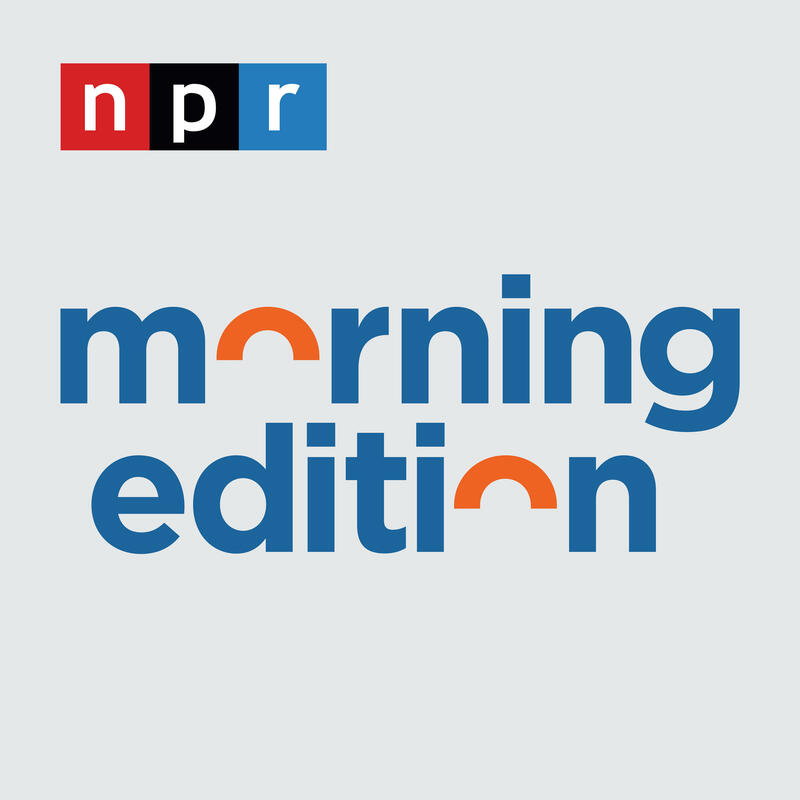 NPR congressional correspondents Scott Detrow and Kelsey Snell contributed to this report. When President Trump meets Nancy Pelosi and Chuck Schumer today, two realities will be apparent. One is that the president needs a deal with the top two Democrats in Congress to avoid a government shutdown. The other is that Democrats in Congress will be more powerful in the new year. NPR White House correspondent Tamara Keith has been asking if Democrats and the president can agree on much. TAMARA KEITH, BYLINE: A little more than a year ago, President Trump had a couple of meetings with Senate Minority Leader Chuck Schumer and House Minority Leader Nancy Pelosi. He said he'd worked out a deal on immigration with Chuck and Nancy, as he called them. PRESIDENT DONALD TRUMP: And I think something can happen. We'll see what happens. But something will happen. TRUMP: Nancy Pelosi and I could work together and get a lot of things done. KEITH: ...On things like infrastructure and prescription drug pricing. NANCY PELOSI: Hopeful that we can work in a bipartisan way in that way. KEITH: But it's not all rainbows. Pelosi and Democrats are also talking about robust investigations of Trump and his administration. And Trump said that would lead to a, quote, "warlike posture." TRUMP: Then, at the end of two years, nothing's done. Now, what's bad for them is, being in the majority, I'm just going to blame them. KEITH: When looking for historical analogies, the period after the 1994 midterms often comes up. Much like President Trump today, President Clinton saw his party's majority in the House wiped out. Then, in 1996, Clinton and House Speaker Newt Gingrich and the Republicans came together to make sweeping changes to the welfare system. NEWT GINGRICH: We have to recognize, this is a historic moment, when we are working together to do something very good for America. KEITH: It was an uneasy and short-lived truce that left many Democrats feeling like the president had sold them out. During this period, Republicans in Congress and Clinton also came together on health care legislation and the budget. Leon Panetta, who was Clinton's chief of staff at the time, points out - these bipartisan accomplishments took time. LEON PANETTA: It didn't just happen. And it took some confrontation at the beginning. KEITH: Confrontation in the form of not one but two government shutdowns. PANETTA: It led to a real political backlash that hurt the Republicans. And it was as a result of that, I honestly believe, that Speaker Gingrich figured that it would be much better for them to try and cooperate. KEITH: But since then, there have been 25 years of partisan trench warfare. Now the questions are whether Democrats are willing or able to compromise with Trump. Is Trump willing to deal? If he is, will congressional Republicans go along? And given the way Trump has changed his mind in the midst of past negotiations, will anyone trust him? Still, allies of the president and Pelosi interviewed for this story say they see potential for compromise. Marc Short is the former director of legislative affairs for the Trump administration. MARC SHORT: I think there are several positions the president has that, frankly, line up more, traditionally, with Democrats. The question, I think, that is yet to be determined is whether or not Democrats will give their leadership the flexibility to negotiate with the president. KEITH: And John Lawrence is a former chief of staff to Pelosi. JOHN LAWRENCE: She is going to be - and I think the Democrats in the House are going to be concerned with proving that they can be trusted, that they can govern. And if that involves having to make deals with Senator McConnell or President Trump, then I think they will do that because that's what they've been hired to do. KEITH: Short and Lawrence both see incentives for their party to get something done - while questioning whether those incentives exist for the other side. (SOUNDBITE OF SLUM VILLAGE'S "FALL IN LOVE (INSTRUMENTAL)") Transcript provided by NPR, Copyright NPR.